Use of shared resources – Instead of providing each application with a fixed amount of processing power and storage, cloud computing provides applications with resources from a shared pool. This is typically done using virtualization technology. On demand use – A cloud is able to quickly scale up and down in term of resources. When temporarily more processing power or storage is needed, for instance because of a marketing campaign, the cloud can scale very quickly to the demand. When resource demand goes down, the cloud resources can scale down as well. Pay per use – In a cloud environment actual usage of resources is billed. There are no capital expenses, only operational expenses. This in contrast with the investments needed to build a traditional datacenter. Customer self-service – Because of optimal automation minimal systems management effort is needed to deploy systems or applications in a cloud environment. In most cases, end uses can deploy, start and stop systems or applications themselves. It is important to realize that cloud computing is not about technology, it’s a business model. It enables organizations to cut cost while at the same time focusing on their primary business – they should run a business instead of a mail server. Be aware that when using an cloud based solutions, the Internet connection becomes a Single Point of Failure. Internet availability and performance becomes critical and a redundant connection is therefore crucial. 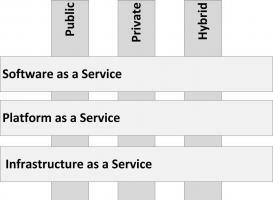 Cloud computing can be divided into three service models and three deployment models, as shown in the next figure. A public cloud deployment model is what most people mean by cloud computing. A public cloud is delivered by a cloud service provider (CSP), is accessible through the Internet, and available to the general public. Because of the typical large customer base public clouds largely benefit from economies of scale. A private cloud is operated solely for a single organization, whether managed internally or by a third-party and hosted internally or externally. It extensively uses virtualization and standardization to bring down systems management cost and staff. As a rule of thumb, a private cloud is cost effective when more than 300 servers are hosted. 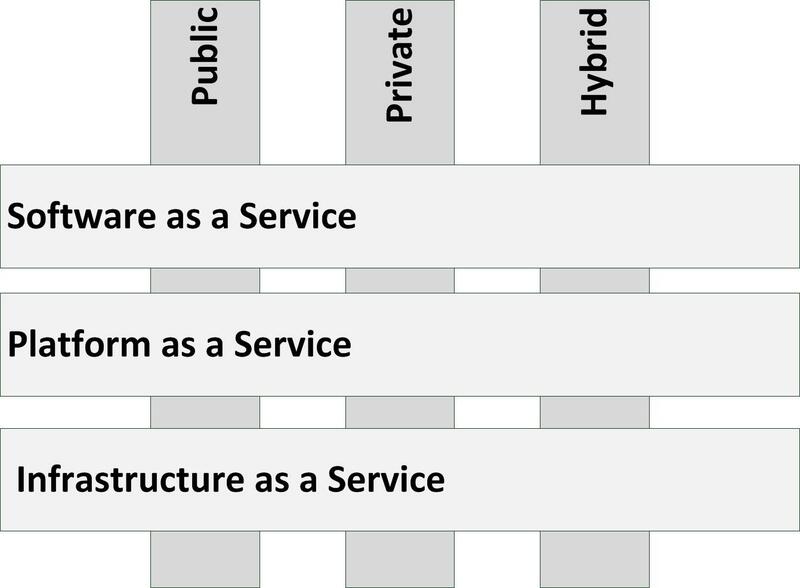 In a hybrid cloud deployment, one part of a service or application is provided by a public cloud, while another part is provided by a private cloud. This enables putting generic services (like email servers) in the public cloud while hosting specialized services (like a business specific application) in the private cloud. Hybrid clouds provide the flexibility of in house applications with the fault tolerance and scalability of public cloud based services. Software-as-a-Service (SaaS) delivers full applications, that need little or no configuration. Examples are Hotmail, Linked-in, IBM Lotus Live, Facebook, Yammer, Twitter, Google Apps, and Salesforce.com. Platform-as-a-Service (PaaS) delivers a scalable, high available, and open programming platform that can be used to build bespoke applications upon. Examples are Microsoft Azure and Google App Engine. Infrastructure-as-a-Service (IaaS) delivers (virtual) servers, networking, and storage. Examples are Amazon Elastic Cloud (EC2), Terramark, and Rackspace. Infrastructure as a Service only provides servers (typically virtual machines), storage, networking and the systems management tools to manage these. In order to use IaaS, users must create and start a new server, and then install an operating system and their applications. Since the cloud provider only provides basic services, like billing and monitoring, the user is responsible for patching and maintaining the operating systems and application software. The main advantage of IaaS is that organizations don’t have to invest in hardware and a datacenter, and they only pay what they use. They still need their own system administrators though. Be aware that not all operating systems and applications can be used in a IaaS cloud; many software licenses prohibit the use of a fully scalable, virtual environment like IaaS, where it is impossible to know in advance on which machines the software will run.